Because of the bad weather, my husband and I had to change the plan of making these chicken legs from barbecue to bake in the last minute last weekend. I don't do the barbecue as I am always afraid of using the grill. My husband is the one who handles this job. He is very skillful at lighting the flame and doing all the grilling. His barbecue is the best I have ever tasted. That is the only moment he would be honoured as the best chef in the family. Nevertheless, I am still the one who marinates the food before they go on the grill. Since we had to cancel the barbecue, but the chicken legs had already been marinated for four hours in the refrigerator, we still had to cook them for dinner. So I decided to bake them. The switch turned out real good. The chicken legs came out so juicy and tender as I kept all the marinated liquid in the roasting pan during baking. If we had grilled them, all the marinated liquid would have never been used. It would be wasted as the liquid had got all the aroma and flavors in it. For the bell pepper, I stir-fried it after changing our plan. The final conclusion, we had a wonderful meal. Unfortunately, my husband lost an opportunity to show off his expertise that rainy afternoon. Put all the marinating ingredients in a mixing bowl. Mix well. Put the chicken legs in a freezer bag. Pour the mixture into the bag. Seal and shake the bag until chicken legs are well-coated. Marinate for 4 to 5 hours in the refrigerator. 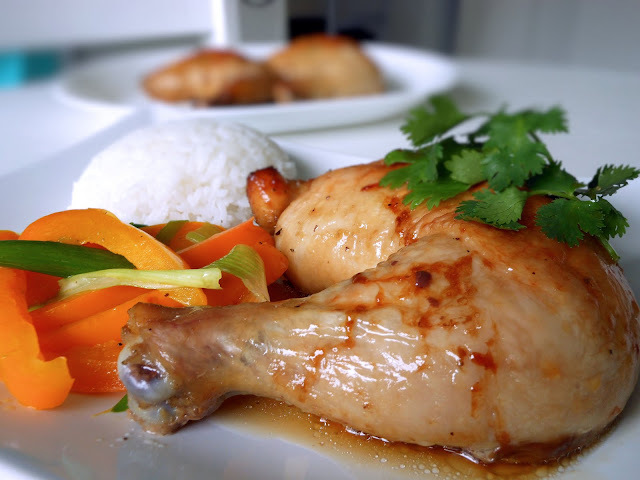 Place the chicken legs in a roasting pan with the marinated mixture and bake for 1 hour uncovered. Remove chicken legs from the roasting pan and put them on a serving plate. Drain off fat and reserve the liquid from the roasting pan. Pour the liquid over the chicken legs. Serve with bell pepper and rice. Put the bell pepper and green onion in the oil and stir fry until tender.